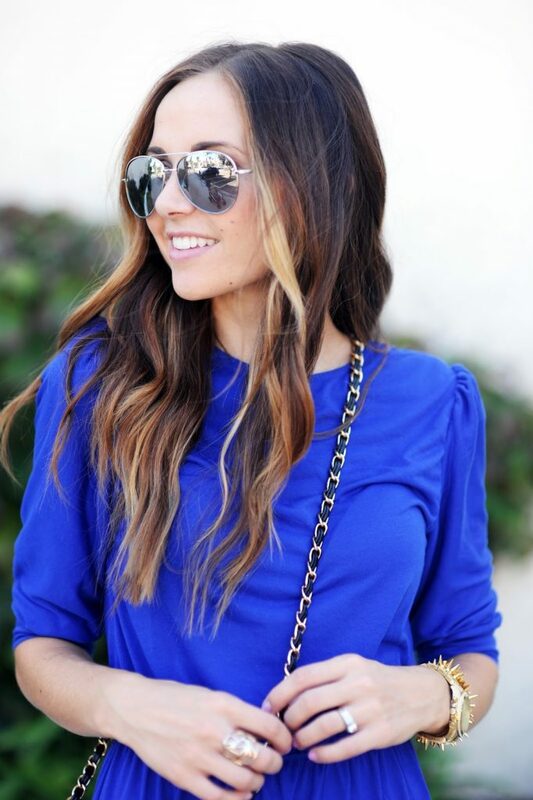 I went on a crazy cobalt kick toward the end of the summer and this dress was one result of it. This dress used to be a sleeveless maxi dress, and I picked it up at H&M (in their basics section) for $15, I think, with plans to turn it into a midi sleeved dress with lace embellishments. But when I was done with the dress and tried it on to determine the lace placements, I loved it so much as is that I decided to leave the lace off altogether. This is a super easy and quick refashion, and one that I love doing (in fact, I did a very similar refashion right here). So if you’re needing a weekend project, go snag a maxi dress (or use an old one in your closet), and get to work! 1. 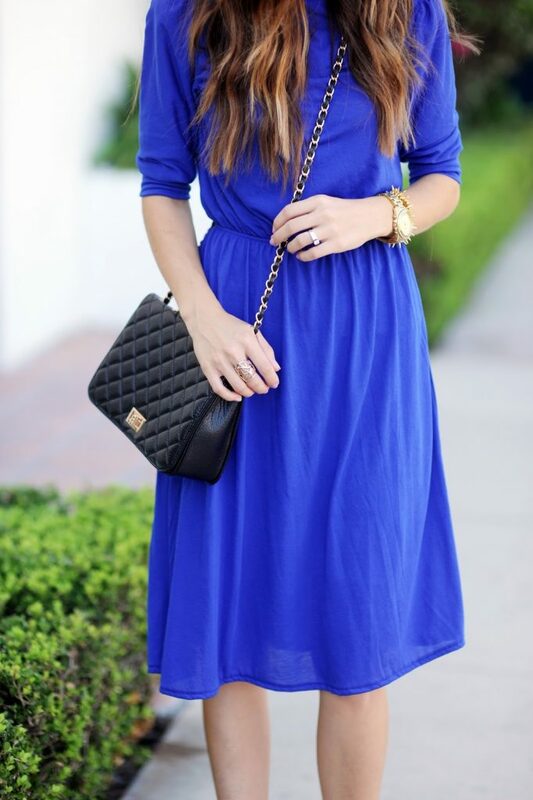 Try your maxi dress on and determine how long you want the new hemline. Mark with a pin and then remove the dress, lay it flat on the ground, and cut. Set aside leftover fabric. 2. Find a shirt in your closet with a similar arm hole size as your sleeveless dress, and then use it as a pattern. Lay it flat on the floor on top of pattern paper (you can use parchment paper, medical paper, or just regular paper instead) and cut around the sleeve. 3. Lay your pattern piece along the folded edge of your fabric and cut around it, adding a 1/2 inch seam allowance. Cut two of these SLEEVES. Then cut the CUFF. For the width of the cuff, measure around your arm (where the cuff will hit), and divide that number in half (since you’ll be cutting on the folded edge). Then cut it roughly 4 inches tall, as shown. Cut two of these CUFFS. 4. Lay the SLEEVE flat on the floor and mark about halfway down the curve on either side, as shown. Then using a basting stitch, sew from one mark the other. Leave your threads long. Using the long threads, pull them to gather the shoulder of the sleeve. Gather as much as you’d like (or until it’s the correct size to fit into your dress’s arm hole). Repeat steps 2 and 3 for the second SLEEVE. 5. Next take your sleeve and, with right sides together, sew up the inseam. Repeat for the second SLEEVE and then set both of them aside. Now let’s move to the CUFF. Fold it in half (right sides together) so the short ends are lined up and then sew across the short side with a straight stitch. 6. Once the CUFF has been sewn into a loop, fold it in half, as shown. Repeat steps 5 and 6 for the second CUFF.7. Now it’s time to attach the cuff to the sleeve. Stretch the cuff wide, as shown. 9. Now lay the cuff down flat and it should bounce back to be smaller, making your sleeve gather and giving it some volume. 10. 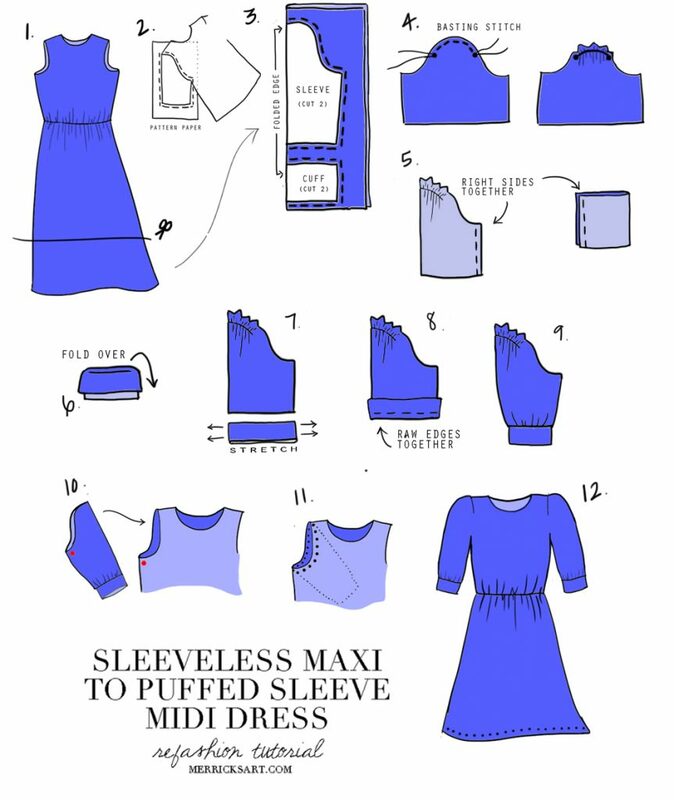 Turn your dress inside out, and slip the sleeve into the arm hole (right side out), matching up the seams at the armpit. Pin in place. 11. With the sleeve tucked inside the dress and pinned into place, sew around the arm hole. Repeat steps 10 and 11 for the second sleeve. 12. Hem your dress by folding it under twice and stitching around the entire hemline with a straight wide stitch. Press all your seams and you’re done! Gorgeous!! You’re totally rocking my world with your DIYs!! I love this!! Ps- Your hair looks amazing here!! Love it! Hope you have a great weekend! I love this! Long sleeve short dresses are my favorite, but so hard to find. Thanks for the tutorial! So cute!! You are just so creative!! Wow this looks amazing, you’re so talented! Thanks! You are an inspiration. I need to break out my sewing machine!! What ring are you wearing on your middle finger? Beautiful post. I like it so much. SOBATPOKER – Agen POKER ONLINE terpercaya ,bandarq, sakong, capsa susun dan domino qiu qiu,bandar ceme, adu q,poker online uang asli Bank bca mandiri bni dan bri. Great website and I look forward to seeing it improve over time. Superb!